Honorable Justices of Supreme court, Justice J M Panchal and Justice H L Gokhale dismissed two special leave petitions filed by ISKCON Mumbai to initiate contempt action against Sri Chanchalapathi Dasa, Sri Stoka Krishna Dasa and seven other members of the Governing council of ISKCON Bangalore. The court observed contempt of court proceedings are meant to protect the dignity of the court but the petitioners in this case have put this application as they have an axe to grind against the respondents. The divisional bench of Supreme Court was hearing a petition filed by ISKCON Mumbai here in the capital. ISKCON Bangalore and ISKCON Mumbai are having doctrinal differences on succession to seat of the acharya of ISKCON, which was founded by His Divine Grace AC Bhaktivedanta Swami Prabhupada. ISKCON Bangalore going by the strict written directives of its founder Acharya Srila Prabhupada subscribes to the doctrine that His Divine Grace did not appoint any successor acharya after his physical departure. On the other hand Srila Prabhupada established a rtvik system of initiation wherein he continues to remain the only diksa guru of ISKCON. Whereas ISKCON Mumbai, says that the governing body has the right to appoint successor to Srila Prabhupada. 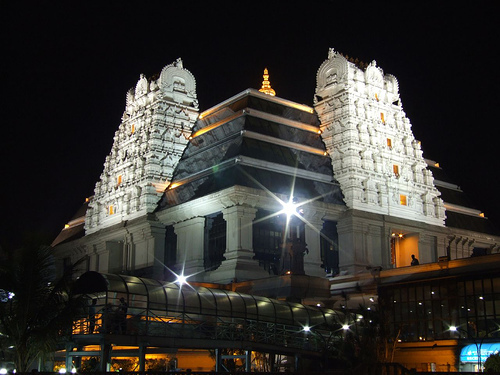 Due to these doctrinal differences ISKCON Bangalore had approached courts to give a permanent injunction against ISKCON Mumbai to not interfere in its administration in anyway. The City Civil court gave permanent injunction to the effect that ISKCON Mumbai should not interfere with the affairs of ISKCON Bangalore. This verdict was passed on April 17th 2009 after the honorable court conducted a day to day trial for over three months with over seven hundred documents filed by both sides. ISKCON Mumbai had appealed against this permanent injunction in the Honorable High Courts of Karnataka. The appeal came before a divisional bench headed by Hon Justice KL Manjunath. During the course of the hearings Sri Jaichaitanya dasa the secretary ISKCON applied to the divisional bench that Hon. Justice Manjunath should recuse from the case. On receiving the application Hon. Justice Manjunath recused from the case but sought to initiate contempt proceedings against Secretary of ISKCON Bangalore and several other advocates. The case is still under progress in the High court. ISKCON Mumbai filed a petition in the High Court, on its own seeking to initiate contempt of court proceedings against entire ISKCON Bangalore society’s Governing Council. Its plea was that the entire Governing Council was responsible for the action of Secretary and that their silence is also an indication of their complicity in the contempt. The divisional bench headed by Hon Justice Sreedhar Rao, dismissed the application of ISKCON Mumbai giving its verdict that Governing Council of ISKCON Bangalore cannot be made party to the contempt. On this ISKCON Mumbai appealed to Supreme Court seeking special leave petitions to initiate contempt, which was dismissed by the apex court. Copy of the order of the Supreme Court.